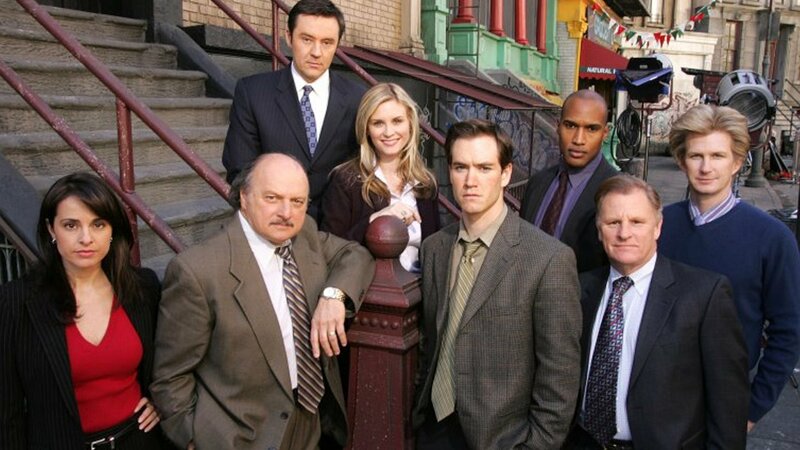 ABC has given a pilot production commitment to an all new NYPD Blue revival series that will revolve around the son of Dennis Franz’s character Detective Andy Sipowicz. The pilot is already in the casting stages for its four main roles. This year marks the 90th anniversary of Mickey Mouse’s big-screen debut in Steamboat Willie on November 18, 1928, and we’ve been celebrating that milestone throughout 2018 with a variety of special events. Now, the ABC Television Network will be joining in the fun with a two-hour prime-time special that was just announced. Get ready, sports fans, for the most competitive season of “Dancing with the Stars” ever as the show fires up the scoreboard and welcomes 10 athletes to sparkle up their uniforms and lace up their dancing shoes as they ready themselves for their first dance on the ballroom floor, on the season premiere of “Dancing with the Stars: Athletes,” Monday, April 30 (8:00-10:01 p.m. EDT), on The ABC Television Network, streaming and on demand. 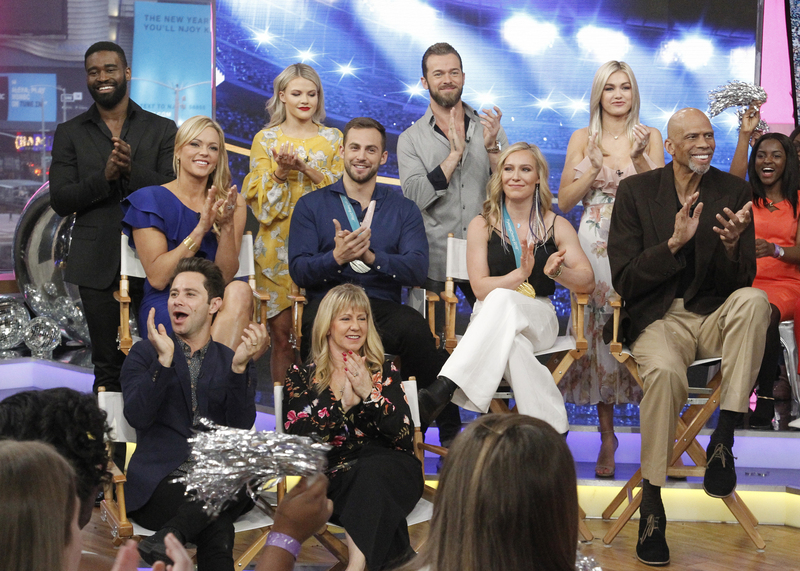 This season’s lineup of athletes includes three Olympic figure skaters, a former Los Angeles Lakers superstar, an Olympic gold medal-winning softball player, a Notre Dame women’s basketball national championship hero, an American luger, a gold medal-winning Olympic snowboarder, a former World Series-winning Major League Baseball player and an NFL cornerback. 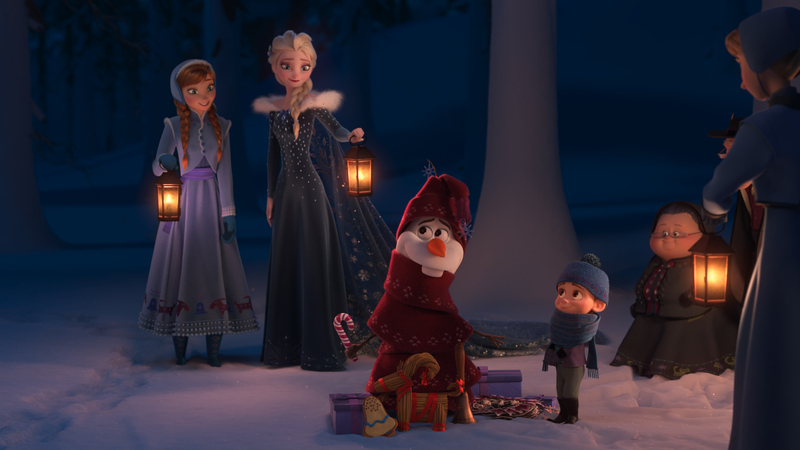 Walt Disney Animation Studios‘ Olaf’s Frozen Adventure makes its broadcast television debut as part of Disney|ABC Television Group’s “25 Days of Christmas” celebration on Thursday, December 14 (8:00-8:30 p.m. EST), on The ABC Television Network. 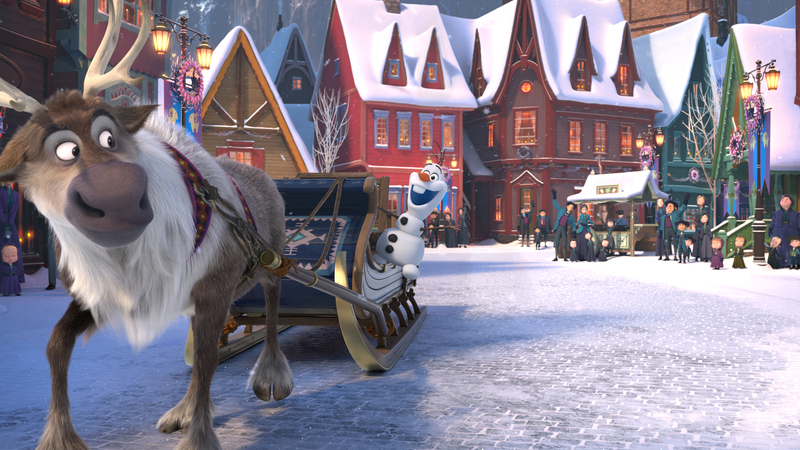 The airing follows Olaf’s Frozen Adventure’s recently-completed limited theatrical run in front of Disney Pixar’s hit feature Coco. 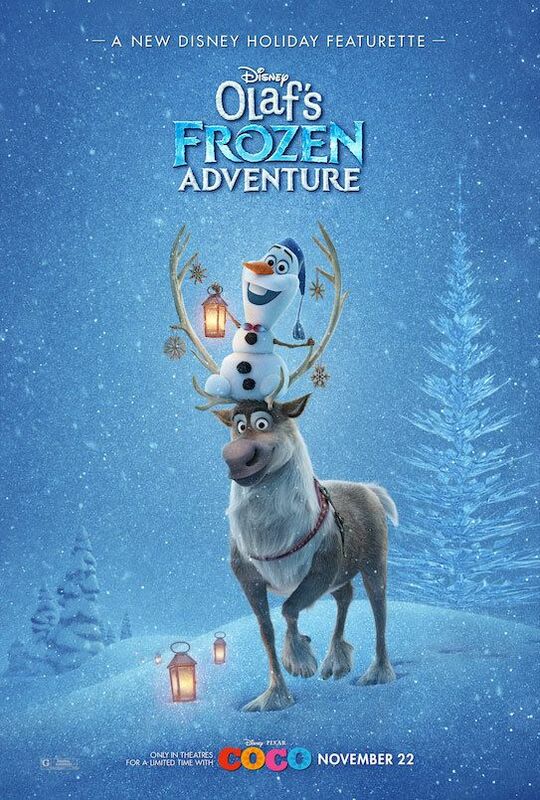 The featurette includes four new original songs and welcomes back the beloved characters (and cast) who won over audiences worldwide in the 2013 Oscar-winning feature Frozen, the top-grossing animated film of all time. 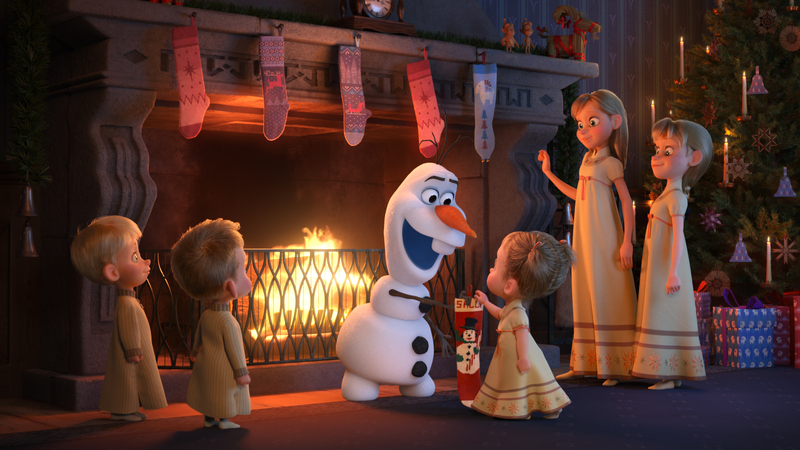 Disney Animation’s Emmy Award-winning holiday special Prep & Landing airs 8:30-9:00 p.m. EST. 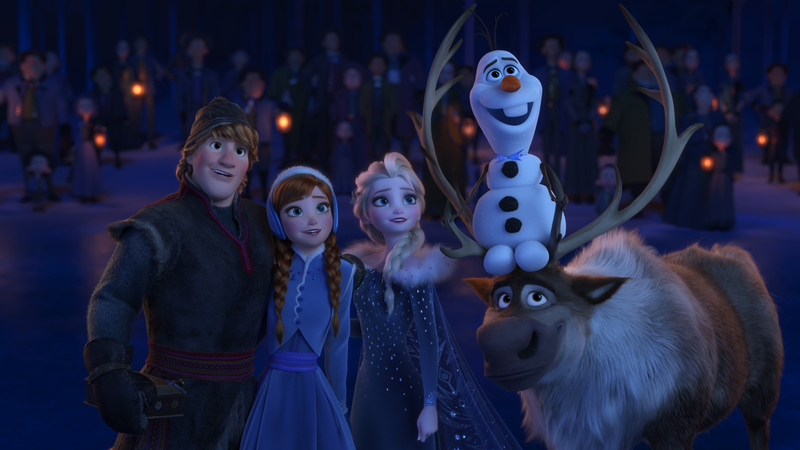 Olaf’s Frozen Adventure features the original cast of Arendelle characters, including Olaf, voiced by Josh Gad (Marshall, Book of Mormon); Anna, voiced by Kristen Bell (Frozen, Bad Moms); Elsa, voiced by Idina Menzel (Broadway’s “Wicked,” “Rent” and “If/Then”; Fox’s Glee); and Kristoff, voiced by Jonathan Groff (Broadway’s “Hamilton,” Netflix’s Mindhunter). 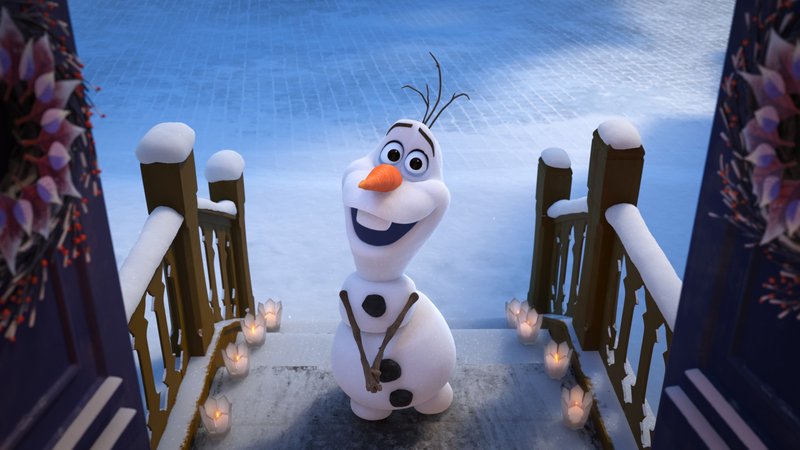 Olaf’s Frozen Adventure is directed by Emmy-winning filmmakers Kevin Deters and Stevie Wermers-Skelton (Prep & Landing) and is produced by Oscar winner Roy Conli (Big Hero 6). The featurette includes a screenplay by Jac Schaeffer and four original songs by Elyssa Samsel and Kate Anderson. IMAX Corp., Marvel Television and Disney|ABC Television Group today announced an innovative agreement to exclusively premiere a new Marvel’s The Inhumans series in IMAX commercial theaters, marking the first time a live-action television series has debuted in this manner. Under the agreement, a version of the first two episodes The Inhumans series – produced in conjunction with ABC Studios and filmed entirely with IMAX digital cameras – will run worldwide exclusively in IMAX for two weeks at the beginning of September 2017. ABC plans to then premiere the weekly series in fall, with additional exclusive content that can only be seen on the network. 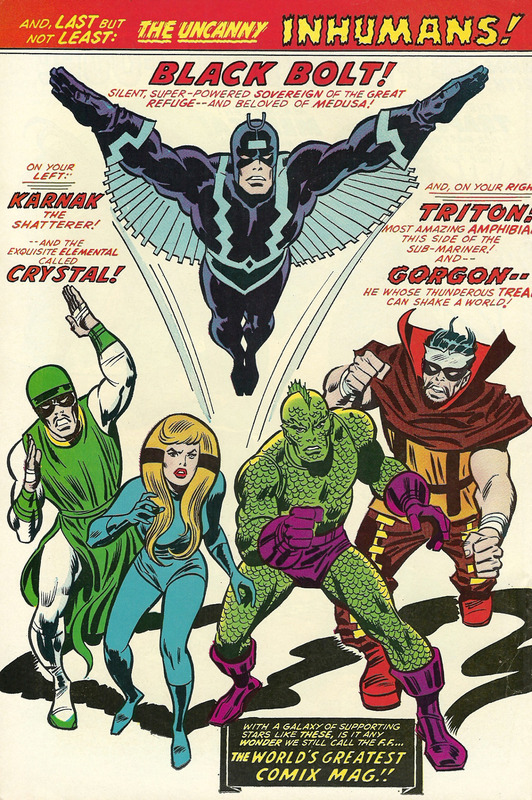 The Inhumans, a race of superhumans with diverse and singularly unique powers, were first introduced in Marvel Comics by Stan Lee and Jack Kirby in 1965. Since that time, they have grown in prominence and become some of the most popular and iconic characters in the Marvel Universe. Marvel’s The Inhumans series will explore the never-before-told epic adventure of Black Bolt and the royal family. ABC, IMAX and Marvel Television also intend to work together to create a joint marketing and promotion plan for the series across their proprietary media platforms – which would be the first such cross-platform marketing launch of a television series. Today’s agreement also marks IMAX’s first time as a financing participant in a TV pilot and series. 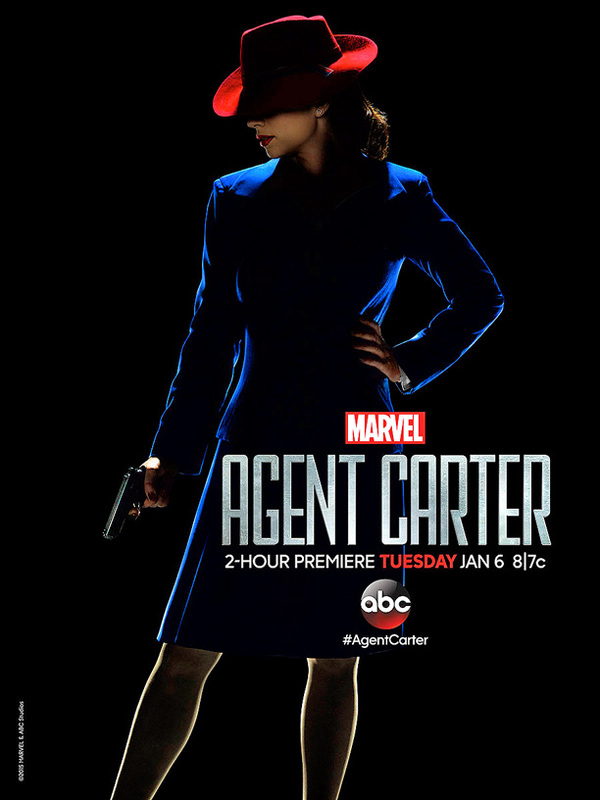 Marvel Entertainment and ABC have debuted a brand new poster for the upcoming “Marvel’s Agent Carter”. Starring Hayley Atwell as Agent Peggy Carter, Chad Michael Murray as SSR Agent Jack Thompson, Enver Gjokaj as SSR Agent Daniel Sousa, James D’Arcy as Edwin Jarvis, and Shea Whigham as SSR Chief Roger Dooley, “Marvel’s Agent Carter” was written by Christopher Markus and Stephen McFeely. Executive producers are Tara Butters, Michele Fazekas, Christopher Markus, Stephen McFeely, Chris Dingess, Kevin Feige, Louis D’Esposito, Alan Fine, Joe Quesada, Stan Lee and Jeph Loeb. “Marvel’s Agent Carter” is set to premiere January 6, 2015 on ABC. 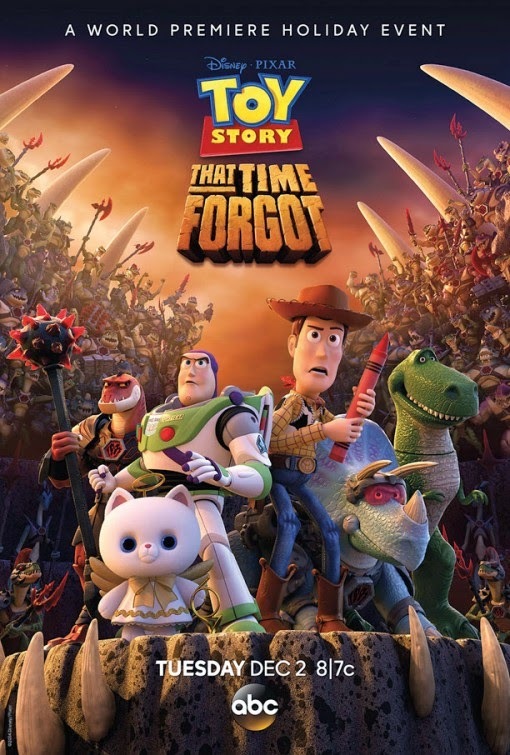 Disney has released a new poster for Toy Story That Time Forgot, Pixar’s latest Toy Story TV special which premieres on Tuesday December 2nd 2014 at 8:00pm on ABC. 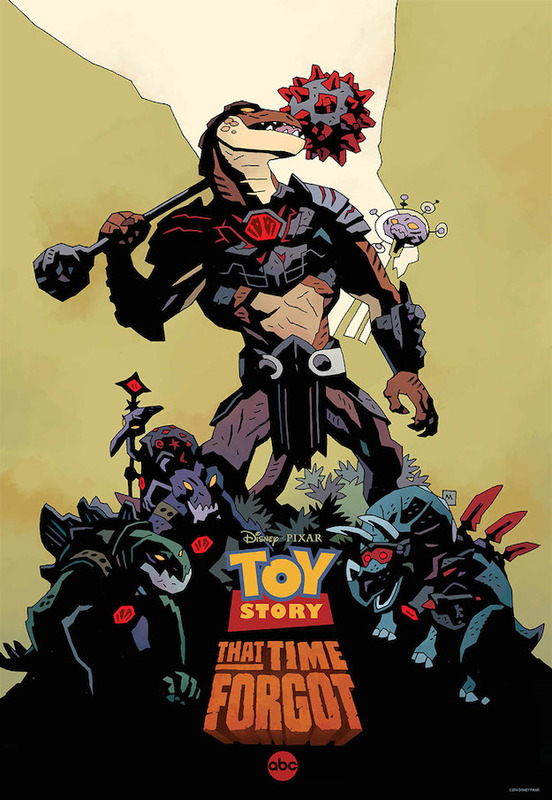 Pixar Animation Studios announced today that their second special for television, “Toy Story That Time Forgot,” will air Tuesday, December 2, 2014 at 8:00pm on the ABC Television Network. The special comes on the heels of the success of last year’s “Toy Story Of Terror!,” which premiered to stellar ratings in October 2013. Announced at Marvel’s S.T.A.T.I.O.N. press event earlier this evening, a prime-time special called Marvel 75 Years: From Pulp to Pop! 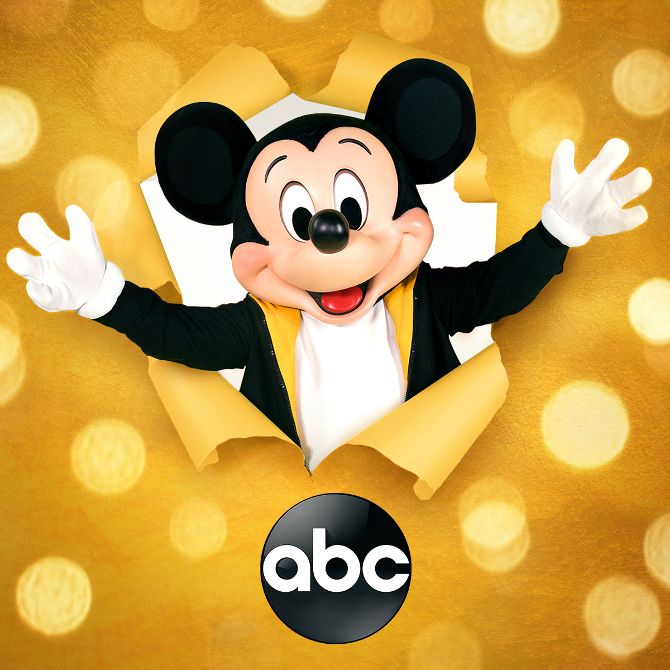 is coming to ABC on Tuesday, November 4, 2014. In celebration of the publisher’s 75th anniversary, the hour-long special will take a detailed look at the company’s journey from fledgling comics publisher to multi-media juggernaut. Hosted by Emily VanCamp (S.H.I.E.L.D. Agent Sharon Carter), the documentary-style feature will include interviews with comic book icons, pop culture authorities, and Hollywood stars. The special also promises an “extraordinary peek into Marvel’s future!” Might Marvel release the first official footage from next year’s Avengers: Age of Ultron or Ant-Man? If they do, you’ll know about it here. 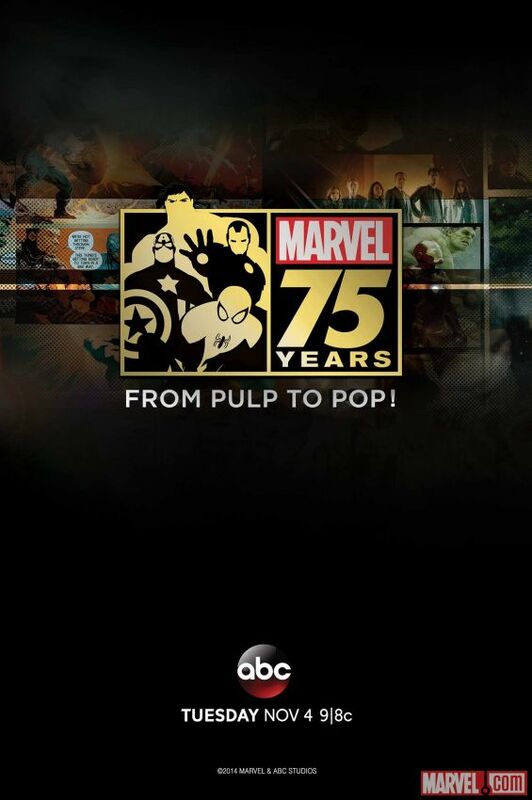 Marvel 75 Years: From Pulp to Pop! airs Tuesday November 4th at 9:00 p.m. on ABC.